The Adopt-A-Shoreline Program was started in March 2012 with Jordan Lake Environment Education (JLEE), Weaver Creek Homeowners Association (Weaver Creek HOA) and Raleigh Sail & Power Squadron. In December, the NC Geocachers Org formally joined although two previous cleanups had taken place. We are grateful to the Biogen Idec Foundation for funding the start up so we could design, purchase and install signs. The results have been spectacular. JLEE has recruited middle and high school students as well as Boy Scouts to assist in maintaining the Wildlife Resources Commission access at Bell's Church, the adjoining Farrington Rd. roadside and the shoreline to the north of the Crosswinds Boating Center ramps. They have also found time to clean the shoreline near the eagle observation deck off Martha's Chapel Rd. 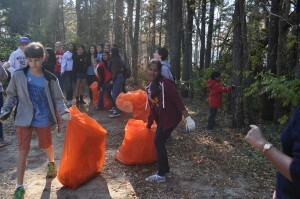 In total, JLEE volunteers participated in eight cleanups and removed 186 bags of trash. As important, they made 175 youth more aware of the trash problem. Eleanor Herr, co-leader of JLEE, points out that trash just continues to pile up only days after each cleanup. She concurs that the long term answer is to reach recreational users of these access points with a message of better environmental stewardship. Weaver Creek HOA has been tackling another habitually littered access point known as Glass Beach, just off Pea Ridge Rd. In three cleanups, 65 bags of trash have been removed. Shelly Ryder organizes her neighborhood group and brings out about nine volunteers for each event. This shows the power of a small group to make a big difference. It is exactly the model we intended in creating the program. The Raleigh Sail & Power Squadron is led by Jim Frei. All of his volunteers are avid boaters on Jordan Lake. Their area of shoreline is across Beaver Creek Rd. from the entry to the Ebenezer Church Boat Ramps. In three events, 12 volunteers have removed 27 bags of trash. and 1 tire. They will expand their area in 2013 to include the boat ramps across the road. Finally, NC Geocachers Org enjoys participating in their sport on Wilderness Island along the Haw River Arm. Before formerly joining the program, they had organized two cleanups in 2012 on the Haw River Arm. In total, this highly energetic group led by Douglas Ward has removed 132 bags of trash and 16 tires in three events involving 67 volunteers. To summarize, the inaugural participants in the Adopt-A-Shoreline Program have done a great job of keeping their shoreline sections free of trash. So far, 278 volunteers have removed 407 bags of trash (that's about 4 tons) and 17 tires. We have six more sections of shoreline ready to adopt. Please consider this opportunity to do your part in preserving the beauty of Jordan Lake.